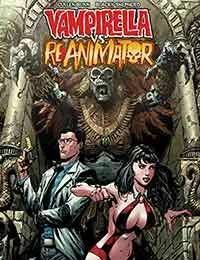 It’s the big question of 2018: How could Vampirella and the Reanimator not have met before now?!!?! Herbert West--the Reanimator--has long sought the secret to perfecting his reagent and break death’s hold on mankind once and for all. The key to his success lies in only one place--the forbidden tomb of the Aztec god of death! But disturbing sleeping gods is as troubling (to put it mildly) as raising the uncontrollable, murderous dead... especially when this deity is an ancient enemy of Vampirella of Drakulon! It''s vampire versus mad scientist in a battle that threatens to tear the gates of the underworld asunder!